4 Bedroom Detached House To Rent in Salford for £1,400 per Calendar Month. The beautiful detached home is both modern and spacious, boasting a spectacular large fully integrated kitchen and dining room with tons of storage, The ideal place to cook up a storm whilst entertaining your family & guests. 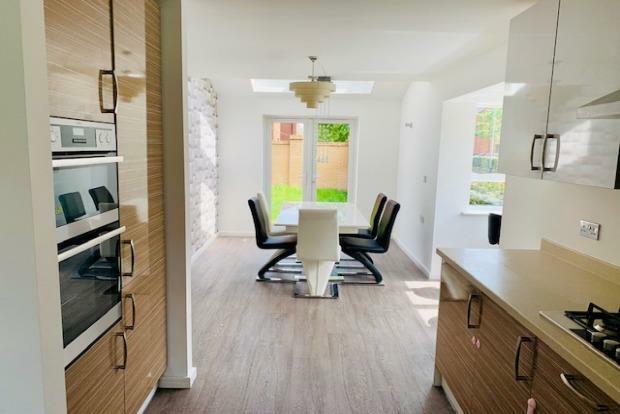 Once you have finished dining, you can move on over to the seperate living room which has patio doors that open up onto the large south facing garden where you can bask in the Manchester sun. Completing the downstairs layout is a WC and large under stairs storage cupboard. Up stairs you have 4 excellent sized bedrooms with plenty of storage. 3 of which are spacious doubles and the fourth which is being used as a walk in wardrobe. You also have a large family bathroom with bath and separate shower cubicle.